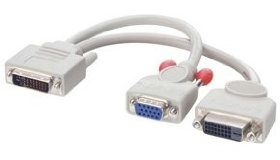 DVI/VGA Splitter cable, DVI-I 29way plug to DVI-D 24way socket & SVGA 15way socket. For connecting eg. a computer with DVI-D out and another computer with analogue SVGA out via a DVI-I KVM switch box to a monitor with standard Analogue computer input (15 way High Density D type) and digital 24way DVI-D socket on an LCD Monitor. A DVI-D 25 way connector has 3 rows of 8 (small flat) pins angled at 45% with a flat spade like connector at one end. A DVI-D connector can only carry a Digital signal. A DVI-I 29 way connector is as described above with 4 extra smaller flat pins, two above the spade connector and two below it. A DVI-I connector can carry either a Digital signal, an analogue signal or both!